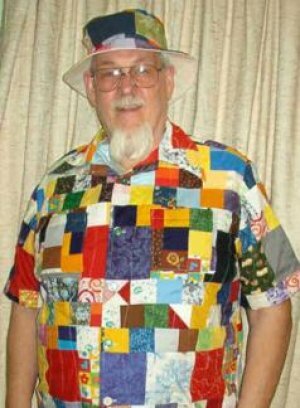 Phil Clark leads off Gallery Page 3 with a creative use of scraps left over from quilting. Using a foundation piecing method, he created yardage over muslin, then cut out the pattern pieces. 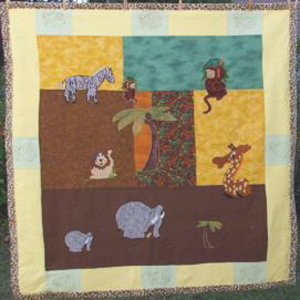 Sharon Hall digitized safari animals in Masterworks II for a baby quilt for a neighbor's new granddaughter. The back of the quilt is soft cuddly animal print that wraps around to the front to form the border. 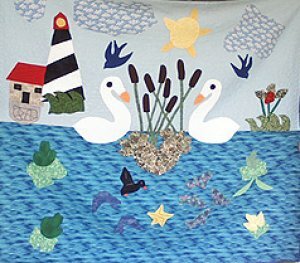 Laura Fisher of Johnstown started with an idea that became a sketch and finally a quilt with applique and embroidery done on her Baby Lock Ellegante. 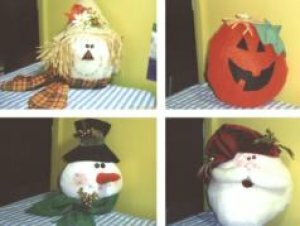 Eleanor Varesco brightens the holidays with a collection of cute faces that add a smile to your tabletop. 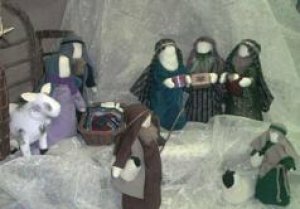 An Amish Nativity sewn by Jane Marsh from the book by Ruth Ann Gingrich and Jan Mast. In accordance with tradition, the muslin faces have no features, but intricate curved seams give them expressive posture.